What do you do when your child starts showing off his wiggling tooth? Don’t even think about ignoring it! Your little one already knows about the money, the gifts and the Tooth Fairy, thanks to his friends and the popular film Rise of the Guardians. As a child, you may have received 25 cents for your first tooth and NOTHING for any of the other teeth that fell thereafter. Be warned, parents, this nonchalant approach to losing baby teeth might not work anymore! So, what is the going rate for a baby tooth? 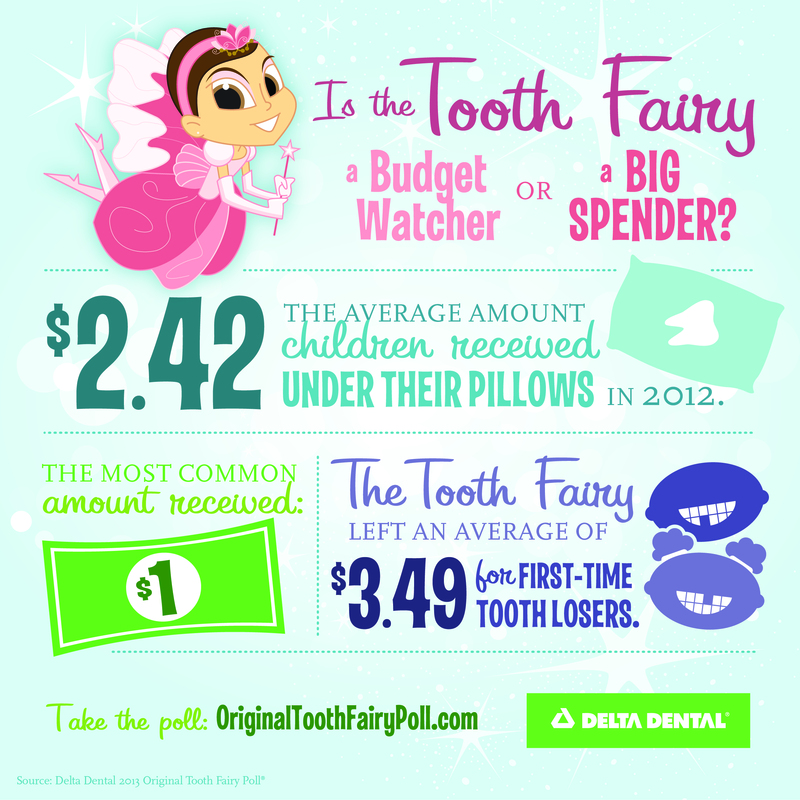 According to Delta Dental’s Original Tooth Fairy Poll, the Tooth Fairy paid an average of $2.42 per lost tooth in 2012 — 32 cents more than she paid per tooth in 2011. If she was collecting a child’s first lost tooth, she was extra generous, placing an average of $3.49 under the child’s pillow. About 2% of tooth-losers received toys, candy, gum, and other gifts under their pillows in lieu of cash. Whatever the Tooth Fairy leaves, use this occasion to reinforce the need for daily brushing and flossing, and the right technique of both. And yes, do leave water and a healthy snack on the bedside table. The Tooth Fairy may be hungry. I saw this great blog where a parent wrote a note as the tooth fairy saying she couldn’t leave the money behind since the girls’ room was so messy she couldn’t find the tooth! I thought it was a great idea to encourage the little girl to clean her room. No one wants to listen to mom or dad but the tooth fairy is another matter!